"Alaska" peas (Pisum sativum "Alaska") are a variety of English peas, which are the most commonly grown in home gardens in America. "Alaska" is one of the earliest-producing varieties, maturing in only 55 days, and is one of the standards in canning peas, according to Purdue University. These peas are popular with home gardeners for their versatility and ease of growth. "Alaska" pea plants grow to between 25 and 35 inches tall. They produce five to seven peas per pod. This heirloom pea, which dates back to the 1800s, features peas that are very round and smooth, unlike many cultivars, which have bumpy skin. "Alaska" peas, as their common name implies, are exceptionally cold-hardy. They can be grown in United States Department of Agriculture (USDA) growing zones that do not have sustained spring or summer temperatures below 20 degrees Fahrenheit. They should be planted in the spring in northern states, and in December through February in the southern states. 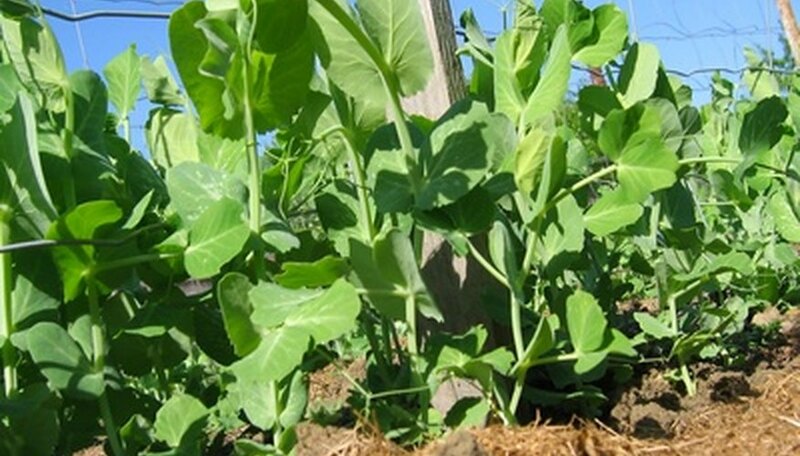 "Alaska" peas should be planted in full sun save in hot climates, where they should be planted in a location that receives some afternoon shade. Plant the seeds between 1 and 2 inches deep, with 2 inches between each pea. Because peas and other legumes make their own fertilizer, dust the seeds with a pea inoculant, which will help the roots produce nitrogen. This is only necessary if there have been no legumes previously planted in that location. Peas need regular watering and consistently moist soil in order to thrive. It is also necessary to stake "Alaska" peas; the pods may otherwise drop to and touch the ground. Provide support with a bamboo stake, trellis or wire fence. Do not fertilize peas. "Alaska" is the best pea variety for cooking, according to Floridata. This pea variety is also one of the most commonly commercially grown varieties due to its starchy texture and tough skin, which gives it the ability to be fried and made into a snack, canned or frozen. While "Alaska" can also be eaten fresh from the plant, it is not as sweet as other varieties of peas. Some home gardeners may prefer to sprinkle the peas with sugar if consuming them fresh from the garden.